An old billboard in Peru now draws water out of the air, purifying it into drinking water. Photo by UTEC. Next Tuesday, the Boston Society of Architects will team with curator/designer Scott Burnham to launch “Reprogramming the City: Opportunities in Urban Infrastructure” an exhibition on creativity in urban design. The exhibition will run from June 25 to September 29, 2013 in Boston’s BSA Space gallery. The exhibition is designed to celebrate cities as centers of innovation and showcase the way that different cities around the world have creatively re-purposed urban design elements to serve new functions. Burnham, who has over 15 years of experience in urban design across the globe, writes that the exhibition will “offer unique perspectives on how the existing hardware of the city can be reprogrammed to increase its functionality by employing a new ‘software’ of imagination and resourcefulness. It is about designing, developing, and creating with the city, rather than for it”. The exhibition will feature a mix of videos, photos, models, and architectural renderings of design elements from over 40 cities, all of which have taken obsolete pieces of the built environment and re-imagined them in bold new ways. These three examples of urban ‘reprogramming’ instantly caught our eye here at TheCityFix. 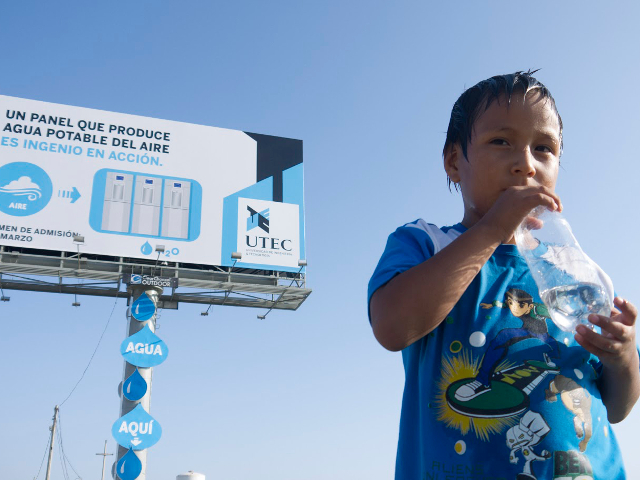 Peru’s University of Engineering and Technology (UTEC) partnered with international advertising agency DraftFCB to turn an old billboard into what is essentially the world’s tallest – and most unusual – well. Peru, a country that gets less than two inches of rain per year, has long struggled to provide clean water to many of its poorer residents. In rapidly growing Lima, this often means that communities on the fringe have had to harvest polluted water from unsafe wells or simply go without. To address this issue, UTEC capitalized on the fact that Peru has an atmospheric humidity of roughly 98%. To convert that atmospheric moisture into water, the billboard uses a process called reverse osmosis, which purifies the water and stores it in 20 liter tanks. Residents can then access the water through dispensers at ground level. The university reports that the project generated 9,450 liters of water in its first three months. To see it in action, view the video below, produced by UTEC [Spanish]. Innovation is not limited to the world’s megacities: small and mid-sized cities are getting creative, too. Umea, Sweden – a university town of about 117,000 residents – is taking unique measures to counteract the long, dark winters that plague the Nordic nation. 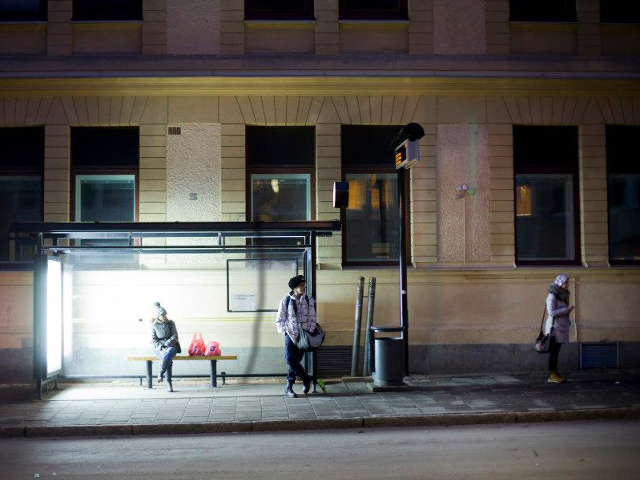 Energy company Umea Energi installed the phototherapeutic lights at bus stops throughout the city to give residents a boost of energy throughout their day. During the winter, Umea gets roughly five hours of sunlight per day. Phototherapy aims to combat this by projecting light with a small amount of UV radiation to make up for what people miss once the sun sets. Bus stops throughout the city are equipped with phototheraputic lights. Photo via Umea Energi, by Johan Gunseus. Ultra-dense and ultra-hilly, the mountainous terrain of Hong Kong has long posed challenges to urban planners and designers. The result is a network of staircases and escalators that help pedestrians navigate from peak to peak throughout the city. Until recently, these staircases were constructed primarily using concrete, with little thought given to how they might function as public spaces. In order to make these spaces more inviting and livable for the people that use them daily, Hong Kong’s Edge Design Institute created a series of public art installations that act as benches and incorporate plant life at the same time. The installation, which Edge calls the “Cascade”, is made of brightly colored wire mesh, and is woven into the stair railing. Pictures of the finished product (completed in 2006) can be found at the project’s website. Is there a ‘reprogrammed’ design element in your city? Leave a comment below and tell us about it!